Unova Pokémon League as it appears in Smash. Unova Pokémon League (イッシュポケモンリーグ, Isshu Pokémon League) is a stage in Super Smash Bros. for Nintendo 3DS and Super Smash Bros. Ultimate. Jigglypuff is fought here in its unlocking battle in the 3DS game. The basic structure of the stage consists of a main platform which reaches the bottom of the stage and two raised soft platforms on both sides. However, at times, N's Castle rises in the background. This summons two ramps which crash into the sides of the stage, impacting characters they hit, then becoming solid platforms that lead at angles up to the side blast lines. Afterwards, Reshiram or Zekrom will fly in to attack. The ramps will disappear either as destruction by the dragon, or else after a set time when the dragon leaves. cover the center areas of the field, making it difficult to get to opponents on the opposite side. deal damage and heavy knockback to either side of the stage, as well as destroy the ramp it hits. deal damage and heavy knockback to either side of the stage and tilt the full stage, which resets and removes the ramps after about 30 seconds. Whimsicott, Milotic and Shaymin can also appear in the background. However, they have no gameplay effect and just fly away, with Shaymin changing from its Land Forme to its Sky Forme. In Super Smash Bros. for Nintendo 3DS, the Ω form is set on the main hard platform of the normal form. No background Pokémon appear. 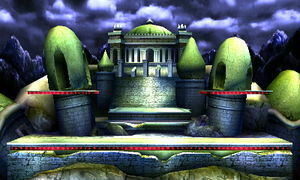 N's Castle remains risen in the background permanently, and no stage transitions occur. In Super Smash Bros. Ultimate, the main platform of the Ω form and Battlefield form is similar to SSB4's Ω form; however, it does not extend below the blastline and is resized and reshaped to match Final Destination and Battlefield, respectively. The three soft platforms of the Battlefield form are based on the ones in the normal form. N's Castle rising up behind the Pokémon League in Pokémon Black and White. The Pokémon League in Unova is located in the mountains in the north of the region, at the end of Victory Road. The main hall is open-spaced, and has six structures: the Pokémon Center, the four chambers housing each member of the Elite Four, and a chamber which houses the Champion. A statue appears in the center, and it acts as an elevator leading to the steps leading to the Champion. The Elite Four members of Unova are Shauntal, who specializes in Ghost types; Marshal, who specializes in Fighting types; Grimsley, who specializes in Dark types; and Caitlin, who specializes in Psychic types. After defeating the Elite Four, the player can fight the Champion: Alder (Black/White), who was not fought in the player's initial visit, or Iris (Black 2/White 2), previously a Dragon type Gym Leader from White. N's Castle is the base of operations for Team Plasma in Pokémon Black and White, and the setting for the final storyline battles of the game. 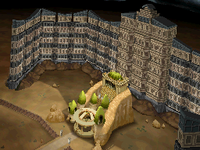 The castle, which surrounds the champion's chamber in the Pokémon League and could be accessed from there during the player's initial visit to the League, is where Reshiram or Zekrom can be caught depending on the version. The caught Tao dragon may fight alongside the player if he or she chooses in the battles against N and then Ghetsis. After defeating Ghetsis, the castle is no longer visible and cannot be visited again. The ruins of the castle appear in Pokémon Black 2 and White 2, which could be accessed from Victory Road during the post-game storyline. There, the player can encounter N, and may face him in a battle. After the initial battle, the player may visit him once per season and fight weather-based teams depending on the season. 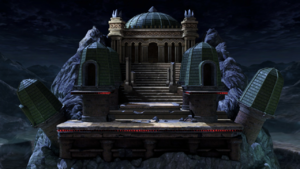 In Smash 4, the stage is universally banned, as the Pokémon in the background can sometimes interrupt gameplay. In Ultimate, the stage is often considered a counterpick with hazards off, as it removes the hazardous Pokémon. It has a strange shape and unusual blast zones, which is likely why the stage is a counterpick. Unova Pokémon League in Super Smash Bros. for Nintendo 3DS. Flames from Reshiram's attack covering the center of the stage. Reshiram's flames covering the steps on the right side of the stage. Zekrom's electric blast causing the stage to tilt. Zekrom's electric blast hitting the center of the stage. Unova Pokémon League in Ultimate. Out of all of the stages that have been redesigned in Ultimate, Unova Pokemon League seems to have the most changes in design compared to that of the 3DS version. A major example can be seen in the background structures, which have changed design entirely to be more ornamental and symmetrical. This page was last edited on April 17, 2019, at 02:29.